Fueled by a two-run home run by Andy Young in the ninth, Surprise went on to secure a comeback win over Scottsdale on Wednesday. Lane Thomas, Connor Jones and Will Latcham also contributed. Results from the game played Wednesday, November 7th. A two-run home run by Andy Young ignited a ninth-inning rally as the Saguaros (10-14) edged the Scorpions, 5-4. The contest was the sole afternoon game scheduled while both of Surprise’s division rivals, Peoria and Glendale, play evening affairs. Down 4-1 with three outs remaining, the home team pounced on Reds’ right-hander Alex Powers (BS, 2) (L, 0-1), who had just entered the game. Cavan Biggio (TOR) led off with a walk, which brought Young to the dish. The Saguaros’ number six batter launched one over the center field wall, trimming his squad’s deficit to one. First baseman Will Craig (PIT) followed Young’s third bomb of the season with a long ball of his own, knotting the game at 4-4. A one-out triple by Nick Heath (KC) and RBI single by Cole Tucker (PIT) gave Surprise the walk-off victory. 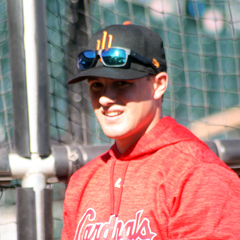 Young’s blast was the third time he reached base, as the second baseman went 1-for-2 with two walks and the previously mentioned home run. 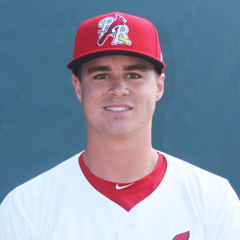 Fellow St. Louis farmhand Lane Thomas also reached base three times while batting clean-up for the Saguaros. Thomas singled once in two official at-bats with a strikeout plus two walks. The right fielder swiped his eighth bag but was also one of three Surprise players to be caught stealing, along with Heath and Biggio. The Cardinals were represented on the mound by Connor Jones and Will Latcham, two of the six Saguaros’ hurlers sent to the bump. Jones tossed a clean sixth to keep the game tied at one all. The righty retired his first batter on a 4-3 ground out before catching Scottsdale’s lead-off batter looking at strike three. A walk and stolen base put a runner in scoring position but Jones closed the frame with a soft 6-3 ground out. Latcham pitched the eighth, replacing Joe Kuzia (TEX) after the latter served up a three-run home run the prior inning. Latcham faced the top of the order, notching a swinging strikeout and fly out to left for the first two outs. A single to right was negated when the 22-year-old recorded a force at second. Right-hander Demarcus Evans (TEX) kept the opposition off the board in the ninth for his first win against one loss. Surprise was eliminated following the evening games. Stubby Clapp misses his chance for three titles in one year – Pacific Coast League, Triple-A and Arizona Fall League. Peoria won this evening, clinching the AFL West Division and eliminating his Surprise Saguaros.